From The Salter, Winter (January) 2017. At Red Brook, the Mashpee, Santuit and Quashnet Rivers, as well as one Long Island NY River, the Connetquot, Annett conducted research to determine if genetic markers from hatchery fish could be found in the “remnant” populations of brook trout in these streams back in 2002 and 2003. And the good news was no indication was found that the remnant populations had these markers in their genes – in other words, the brook trout in these 5 brooks had not descended from hatchery fish. In simple terms, this proved these salters were wild fish – and as you might imagine, this spurred SRBTC founders and others to imagine the possibilities of these fish coming back. Fast forward to the spring of 2015 and Brendan Annett returned to the Santuit to discover that there were no trout to be found in the river. 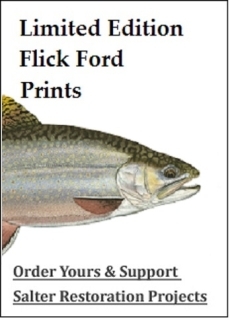 State biologist Steve Hurley, along with assistance from the Wampanoag Tribe as well as help from SRBTC and interns from Patagonia Boston confirmed via electroshocking several times that there indeed were no trout in the Santuit by the fall of 2015. Enter eDNA. Earlier on a trip to Maine, Michael Hopper and Geoffrey Day had met with Dr. Michael Kinnison of UMaine Orono and learned of an exciting new technology that could detect fish in a body of water from a very small water sample. This new technology was called “environmental DNA” or eDNA for short. While it took a while for the information to sink in, by the fall of 2015, it became apparent that SRBTC could be using eDNA technology to see if Steve had missed any fish when he electroshocked the river, and if salters had truly been extirpated from the famed Santuit. By December 2015, SRBTC was sufficiently equipped and trained to begin sampling water to determine if the Santuit River brook trout had been extirpated. While this sounds complicated, it really was quite simple with all the supplies and technology purchased at a local WalMart per specific instructions from Kinnison’s lab. Water samples collected were frozen and shipped by FedEx and by the fall of 2016, we had an answer. The above table shows 0/3, “three strikes, you’re out,” for the Santuit. That means no DNA from brook trout was found in water samples taken from the Santuit River. Following good scientific procedures, samples taken on the same day from known positive Red Brook showed positive, so we knew that the analytic test was working correctly. While this is indeed bad news for the Santuit, there is hope there. On a hot day in July, Mark Hudy and Stephen Perry from the Eastern Brook Trout Joint Venture joined SRBTC’s Warren Winders, MassWildlife’s Steve Hurley and new state Cold Water Biologist Adam Kautza, and it was decided that Santuit was sufficiently cold so that trout could be re-introduced from a plentiful population in a nearby brook. Stay tuned on this as there is much work to be done here. As of this writing, the re-introduction has not taken place. 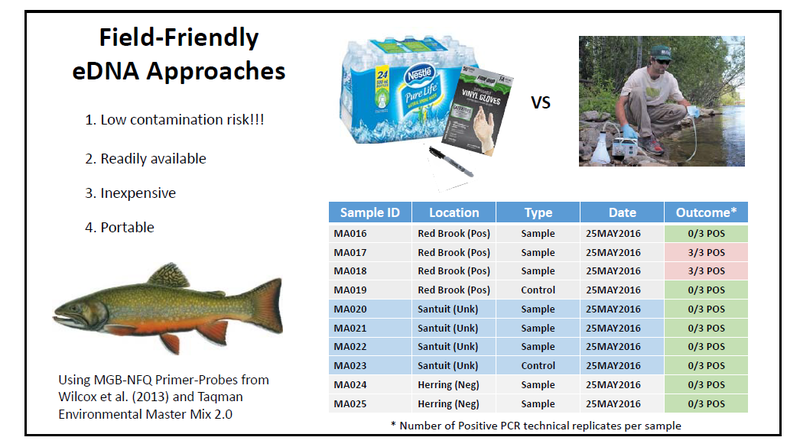 The basic conclusion of the eDNA work is that this emerging technology is good enough to help us determine presence / absence of brook trout using simple, low cost, “citizen science” type techniques. The best news of all is that SRBTC has recently received funding from the Essex County Community Foundation to begin using eDNA tests to sample more salter trout streams. This work will help find “the needle in the haystack” and when we have found that metaphoric needle, we can then prioritize that brook and begin to increasingly focus conservation and restoration efforts there. This work will commence in December of 2016, just in time to mark the anniversary of the first eDNA water sample taken back in 2015 there on the Santuit River. 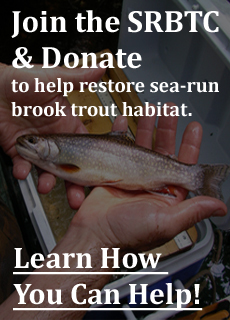 With eDNA, the Santuit’s loss may be a gain for the conservation and protection of wild brook trout in other systems. Geof Day here (2018). 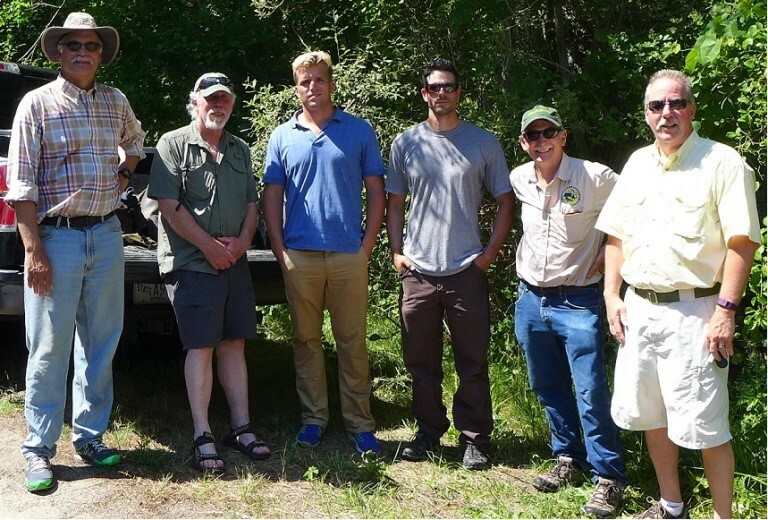 Later in 2017 Steve Hurley and the SRBTC Crew (ably assisted by Chase and Aimee Bartee / TightLoops Fly Video & Photo team) electrofished wild native trout that were transplanted by hatchery truck to the Santuit. They were quite healthy when transplanted in. Sadly in the spring and fall surveys of 2018 only one fish was found. Caperivers.org may have an explanation as to what happened as water chemistry looks highly suspect. Stay tuned for more.